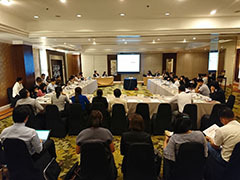 The Japan Bank for International Cooperation (JBIC) held a workshop on February 18, 2019, in Manila, the Philippines, to discuss with the country's government and its agencies about issues and improvements related to infrastructure development in the country under public-private partnerships (PPPs). The purpose was to exchange opinions and views with the Government of the Philippines and their agencies about the risks associated with the government-promoted hybrid PPPs*1, as well as to increase business opportunities for Japanese companies to participate in infrastructure development in the Philippines. During the workshop, PricewaterhouseCoopers International Limited (PwC) explained risks related to hybrid PPPs for infrastructure development. They highlighted the interface risk which occurs among contractors engaged in construction and the operation and maintenance phases (O&M) of the same projects, and discussed how to appropriately generate and measure key performance indicators for private sector O&M contractors by using the examples of other countries. Allen & Overy LLP delivered a presentation about the results of a survey they conducted for projects under a PPP scheme, focusing on restrictions on investment from foreign countries and risk allocation among project participants. An open discussion session followed the presentations, giving attendees the opportunity to exchange their views on PPP. Mr. Pecson, Executive Director of the PPP Center of the Philippines (PPP Center)*2 spoke about the importance of hybrid PPPs and appropriate ways to allocate risk among project participants. JBIC's representative in Manila explained the August 2018 signing of a memorandum of understanding (MOU) for enhanced cooperation in infrastructure development with the Government of the Philippines. JBIC also said that it will promote investment in green infrastructure in the Philippines based on the MOU and under its global financing facility for Quality Infrastructure Investment for Environmental Preservation and Sustainable Growth (QI-ESG), which was established in July 2018. 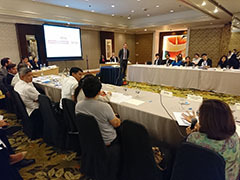 Among the many workshop participants were officials of international organizations such as the Asian Development Bank (ADB) and the International Finance Corporation (IFC), as well as the Government of the Philippines and its agencies. The participants showed much interest in hybrid PPP projects for infrastructure development. JBIC will continue to provide financing support for overseas infrastructure projects involving Japanese companies by drawing on the knowledge of specialists in different fields. *1Hybrid PPP is a project scheme in which the government finances the construction phase of an infrastructure project while the private sector is involved in the operation and maintenance of the project. *2 The PPP Center is a government agency of the National Economic and Development Authority (NEDA) of the Philippines which promotes projects under PPP in the country.